Marc Marquez vowed to take it easy on the dancefloor after bizarrely dislocating his shoulder while celebrating winning a fifth MotoGP title following his victory in Japan. The Repsol Honda rider was crowned champion for a third consecutive year on Sunday after title rival Andrea Dovizioso crashed while trying to catch the Spaniard on the penultimate lap. Marquez's ecstasy turned to agony when Scott Redding pulled up alongside him and reached over for an embrace. Redding managed to put Marquez's shoulder out, prompting the Catalan speedster to climb off his bike and lie down on the track while it was put back in. 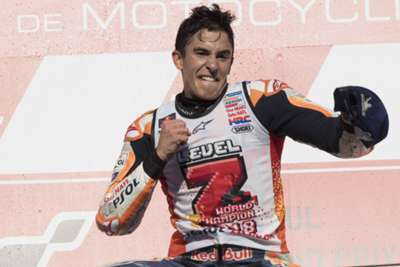 "I was very happy and I arrived there, and I didn't know anything about the celebration," Marquez said of the incident. "I was out of control, like on the track! No, a joke, but Scott stopped and I hugged him and I felt something strange, and dislocated my shoulder. "I just laid there on the asphalt and my brother and Jose put it in again. It was not the first time; maybe it was my weak point of the season because I dislocated it many times during training at home. In December I need to make a stop with the doctor and for next year it will be perfect." He added: "Luckily with the adrenalin it doesn't hurt, but I'll need to be careful not to overdo it on the dancefloor tonight." Aprilia rider Redding apologised on Instagram, posting: "Once we was rivals "big rivals" now we have nothing [but] respect and fun!!! Sorry for the dislocated shoulder."